What Are the Best Varidesk Alternatives? We get this question a lot, and it’s no wonder given how many thousands of people type “varidesk alternative” into search engines every month (perhaps that’s how you even got to this page). No other brand in the office fitness industry gets this many searches for alternatives; in fact few brands get any such search volume. To learn about our top picks in the each of these categories just click on the links above. 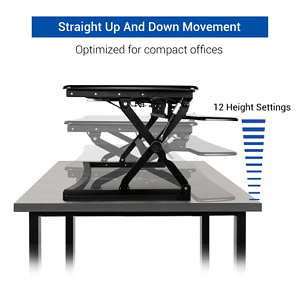 The two most popular categories by far and away are the Z-Lift (which Varidesk lives in) and X-Lift (similar, but lifting straight up and down instead of on an arc motion). Thousands of people seek out “varidesk alternatives” in online searches every month, and for good reason. After lab testing dozens of sit-stand converters or staff reviewers make their top three recommendations for the best alternatives to Varidesk’s overpriced and antiquated product line. There are already three models of the ZipLift, with more in development. The most popular is the ZipLift+, which is 35″ wide and ideal for up to two 24″ monitors. The ZipLift HD (heavy duty) is 42″ wide and great for dual 27″ or larger LCDs, and has a stronger counterbalance to support more equipment. There’s even an American-made version called the ZipLift Patriot for customers who prefer to buy American-made, or just want the fancier 3D-laminated wood surfaces of this upgraded model. Coming soon is a corner-desk model, the ZipLift Corner Standing Desk Converter. 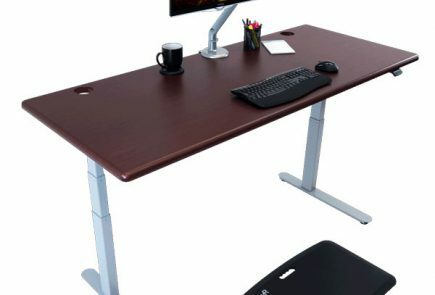 Another really cool thing about the ZipLift (and iMovR’s other standing desk converters, the Cadence and Cadence Express) is that the company offers a conquest bonus of $35 if you or anyone in your organization have previously owned a Varidesk or any other make of desktop workstation. So you can easily walk away with the top-rated Varidesk alternative for at least $100 less, including a free standing mat and free shipping. Keyboard tray is removable making it ideal for use with just a laptop and no external keyboard. Flexispot has multiple models now, including the Flexispot Compact Series (27″ / 32″) and their original Flexispot Standing Desk Converter Line including the 35″, 47″ heavy lifter, and 41″ corner models. Like the ZipLift, the Flexispot features a five-year warranty and free shipping. From iMovR’s hover line, the Cadence Express is basically a giant monitor arm with a keyboard tray platform that’s perfect in certain situations. 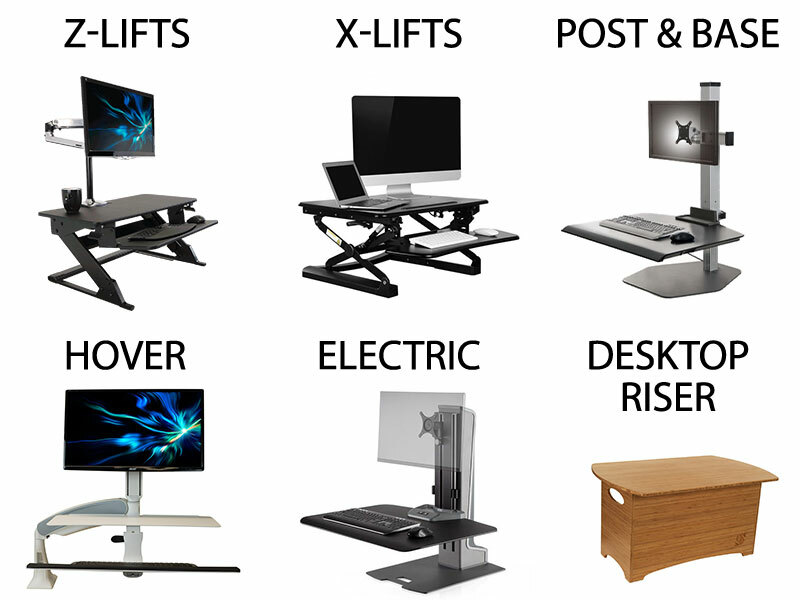 What you give up with a hovering sit-stand converter is the rock-solid stability of the ZipLift or Flexispot models, but what you can is in return is your entire desktop whenever you want it. Just push the entire thing aside when you want to access papers or do anything else that doesn’t require your computer. Ideal uses for hover-style sit-to-stand converters include reservations counters (they’re very popular in the hospitality industry), or any job that requires handling a lot of paperwork, such as in billing departments, health care administrations and government/utilities offices. 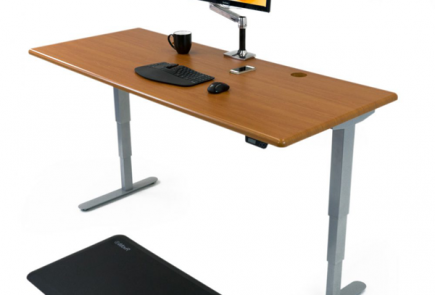 There’s also a big brother to the Cadence Express, the original iMovR Cadence, which is significantly larger and heavier-duty, with more ergonomic adjustments than any other standing desk converter on the market. You can check out all our Varidesk Reviews, as well, including the Varidesk Pro, Varidesk Laptop 30 Sit Stand Workstation, VariDesk Pro Desk 54 Adjustable-Height Desk, Varidesk Cube Corner Corner Standing Desk Converter, Varidesk Pro Plus Standing Desk Converter, Varidesk Exec Series, Varidesk Cube Plus Review, as well as the Varidesk ProDesk 60 Electric. We’ve even reviewed all their standing products, including the Varidesk ActiveMat, Varidesk Groove Standing Mat, Varidesk ActiveMat Rocker and Varidesk “The Mat” Standing Mat. To see all of our reviews of lab-tested products in this category see our Best Standing Desk Converters Reviews.